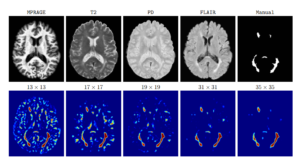 Researchers from the National Institute of Health and Johns Hopkins University developed a deep learning algorithm to detect multiple sclerosis (MS) from magnetic resonance imaging (MRI). MS is a disease of the central nervous system, in which the body launches a defensive attack against its own tissues. MS can range from relatively benign to somewhat disabling to devastating. MRIs are a very important tool in diagnosing and treating MS, as they can reveal the telltale scars, also called lesions, on the brain or spinal cord. However, manually segmenting lesions from 3D images is tedious, time-consuming, and often not reproducible. 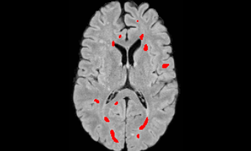 “There is an inherent reliability challenge associated with lesion segmentation, therefore robust and accurate segmentation of white matter lesions from MR images can provide important information about the disease status and progression,” the researchers included in their research paper. 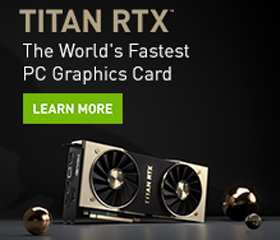 Using an NVIDIA TITAN X GPU and the cuDNN-accelerated TensorFlow deep learning framework, the researchers trained, tested and evaluated their convolutional neural network on over 210 MRI scans. After training, it only takes a few seconds to segment lesions on a new image, the researchers said. The dataset with various patch sizes is shown. As the patch size increases, the false positives in the cortex begins to decrease. The team selected 35 x 35 patches for this project. The researchers said their neural network produced a score of 90.48, slightly higher than a human rater. The team’s goal is to achieve better accuracy and more consistency in segmentation. They will continue their research by comparing their convolutional neural network based methods with other published work. Using deep learning to analyze MRIs can help doctors better assess current treatment and future options for their patients.